A Great Week for Team OnPoint! 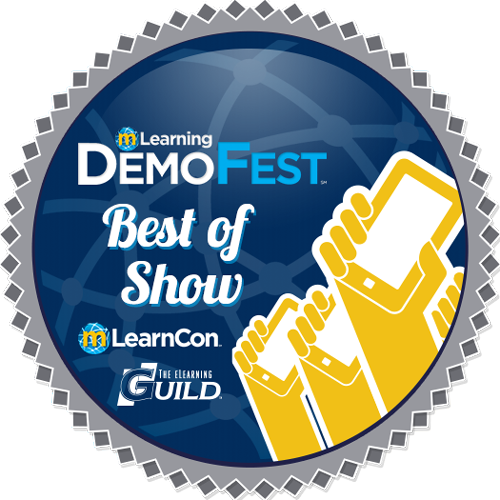 Last week was a terrific time for our company as we attended The eLearning Guild’s annual mLearnCon Conference & Expo this year held in San Diego, California. OnPoint generally participates in 6 to 8 different events every calendar year but we consider mLearnCon our “Super Bowl” given its focus on enterprise mobile learning with a simpatico audience, session schedule and exhibitor roster to match. We also plan out much of company’s marketing campaigns and core product and feature releases around this June anniversary so the time spent thinking about, preparing and delivering for mLearnCon week is considerable. We launch months ahead with tall ambitions and high hopes alike, and this year’s event did not disappoint. Its hard not to compare how things have progressed so quickly in this fifth iteration of the conference too; the first mLearnCon event in June 2010 had only 175 attendees and seven vendors in stark contrast to this year’s event with 1,050 registered participants and forty four vendors. Our industry is maturing nicely. Our normal conference prep practices took a backseat to the broader mandate wherein we planned to refresh our company image and go-to-market messaging with all identity for our core products and services in time for the show. This meant a completely overhauled and responsive web presence, a more modern trade show booth (purchased used on eBay but new to us at least), a reduxed digital display, new enticers/giveaways, updated business cards and more. Our new booth enjoyed perfect placement right inside the main Expo Hall doors and was easy to find/hard to miss. Special thanks go to my partner Katherine Guest as well as Paige Harris, our Marketing Manager, for their stellar efforts to update/rewrite/renew everything we use to position our company, team and experiences. The conference schedule kicked off with a well-attended full day preconference workshop titled Serious Games vs. Gamification: Which Way Should We Play on Mobile? we conducted on Monday along with Bryan Austin, Chief Game Changer at OnPoint technology partner GameOn! Learning. The dozen plus attendees gained a deeper understanding of how game mechanics and dynamics are best applied to learning situations and the workshop leveraged efforts from the OnPoint and GameOn teams to integrate OnPoint’s core Gamification Engine with the mLevel solution set GameOn resellers to larger enterprises. Several of the attendees are considering pilot efforts to better measure the potential of game-based learning initiatives at their own organizations. The main conference launched on Tuesday morning with welcoming remarks from The Guild, the first keynote and doors to the Expo Hall held open for the 1K+ attendees. The steady traffic that flowed into our booth for two days all seemed to have the same purpose in mind and one that’s matured from past mLearnCon events; namely, its no longer a question of “Is mLearning right for my company” but rather “Who’s going to help me implement my mLearning strategy? And what tools/platforms/content will help get us there easier and faster?” This represents a pleasant shift from years past and is indicative of where the L&D industry stands WRT (“with respect to”) including mobile in their current and upcoming training initiatives. OnPoint presented or co-presented three other Concurrent Sessions during the two and half-day schedule that were all well attended and buzzworthy. Teams from W.W. Grainger and AutoTrader Group both provided case studies of their successful enterprise mobile implementations that focused on their unique approaches as well as their measured outcomes. Wednesday evenings’ DemoFest was once again a highlight of the conference with thirty three teams squaring off in a “science fair” inspired competition that allowed attendees to walk around and hear/see 3-minute practical demos from the mobile practitioners who designed and built those projects. We’re pleased to report that our joint entry with AutoTrader Group, presented by Cory Colton and myself perhaps twenty times over two hours, earned the “Best in Show” designation as Project of the Year! Finally, I was humbled and proud to be named a “Guild Master” by The eLearning Guild in recognition for our entire company’s continuing efforts to design, develop and provide solution sets that drive innovation in enterprise mobile learning. My name may appear on the plaque, but it is the tireless efforts, technical wizardry, and unwavering commitment to customers and partners by our entire staff that made this recognition possible. I thank our team and I sincerely thank The eLearning Guild for their support. Now, it is time to go deliver on those many promises of assistance to our prospects, customers and the market we serve. We hope next year’s mLearnCon event to be held in Austin, Texas can be half as rewarding too.